OCTOBER RELEASE and BLOG HOP! CHRISTMAS in SEPTEMBER - NEW RELEASE! I've got all my tags made for Christmas! Made about 50 of these so I won't run out like I did last year! Four designs are included in the WINTER TAG SET with sizes from 2" x 3.12" to 2.25" x 3.25". My favorite is the Penguin, which I designed especially for my BFF! Also, I have brought back the BOTTLE OF CHEER, which I originally designed back in 2011. I had retired it earlier this year, but after some inquiries as to what happened to it, I decided to update it and is now available again… and just in time for celebrating the New Year! Are you ready to save BIG? Before all the crazy Black Friday sales begin, stop by my SHOP to save 40% off everything in the store! Hurry because this BIG sale ends November 28th. Thanks for stopping by and to all my US friends, have a very Happy Thanksgiving Day!!! 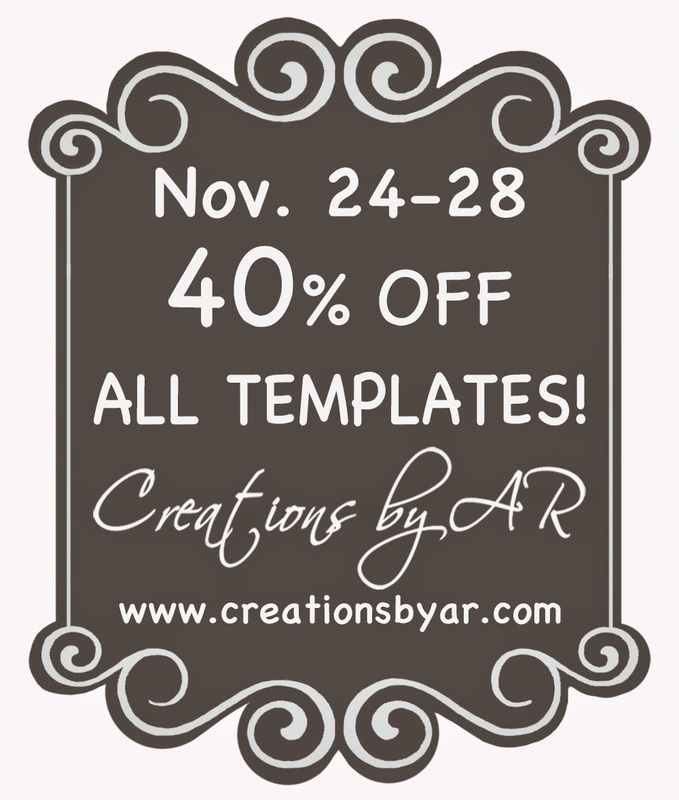 Welcome to Creations by AR's October Release and Blog Hop! 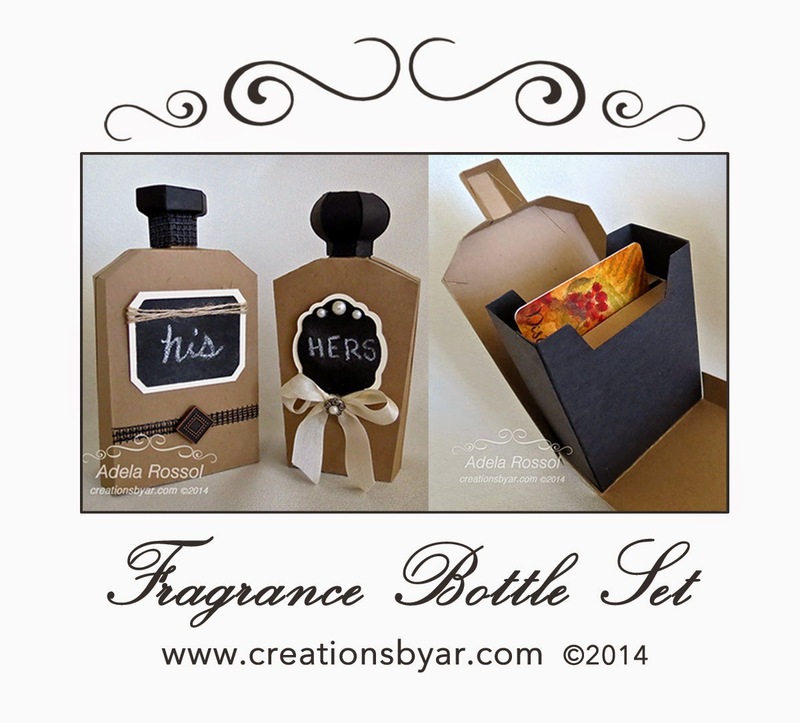 This month I have two new templates that I'm so excited to show you: the FRAGRANCE BOTTLE SET and the CARD ARMOIRE. The FRAGRANCE BOTTLE SET includes two box shapes and three labels. Each box has a removable insert for holding photos or gift cards. Here, I made a "His and Hers" matching gift set! 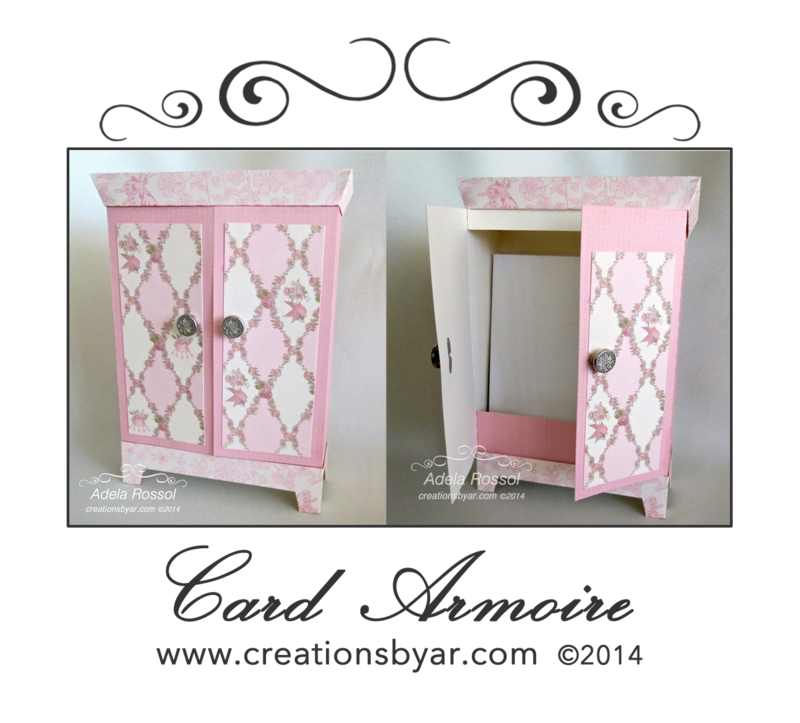 The CARD ARMOIRE has plenty of room for handmade cards, envelopes and tags! The cover is attached to the back with a "hinge" and lifts to allow the doors to open. Two random winners will each receive one of the new templates. All you have to do is leave comments on the designers' blogs and you will automatically be entered in the drawing! Comments are also accepted on our Facebook Page. The more comments you leave, the more chances you'll have! Comments will be accepted until Friday, October 17. Adela Rossol <-- you are here! Enjoy the Hop and thank you so much for stopping by! Oh what fun it was to make this Gingerbread Gift Bag! Use these Starry Trees as fun gift boxes or as festive decorations! Can you believe three boxes are in this Stack a Snowman? 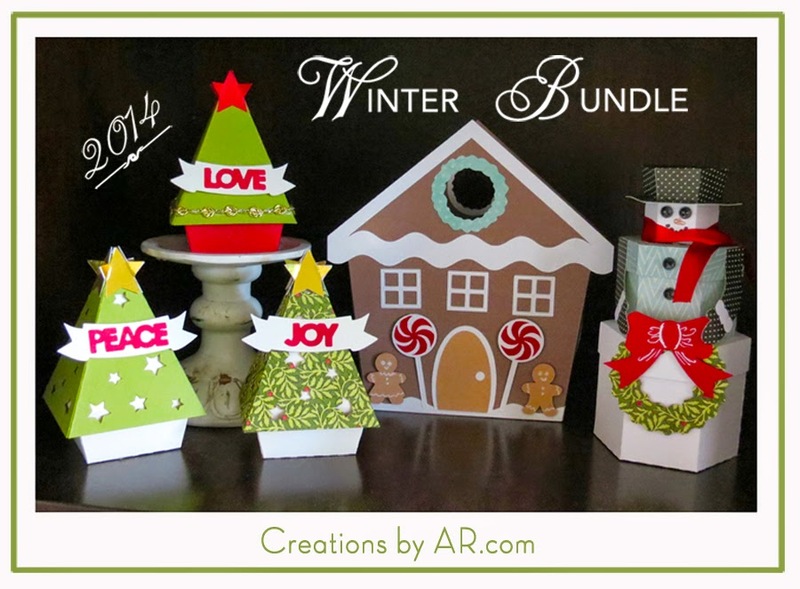 Why not get all three in this Winter Bundle Set? THREE WINNERS WILL BE CHOSEN RANDOMLY! • Leave comments on each designer's blogs and on AR Facebook Page. The more comments you leave, the more chances you will have of being chosen. • Comments are accepted until Friday, Sept. 12. • Three random winners will be announced on Saturday, Sept. 13 on the Creations by AR Website and on our Facebook Page. Ready to visit the other AR Girls and get inspired? Just click on the links below! Welcome to Creations by AR's Beach Hop! This month I have two new templates to get you in the mood for summer! The first one is a fun Sandy Beach Bucket that stands at 4 inches tall (without the handle) and has a 3-inch diameter opening. This would have made a great party favor for my girls' end of school year parties when they were younger! The second template is a matching 3D Beach Bucket Card with a "sandy" stand that folds flat to fit nicely into an A2 size envelope. 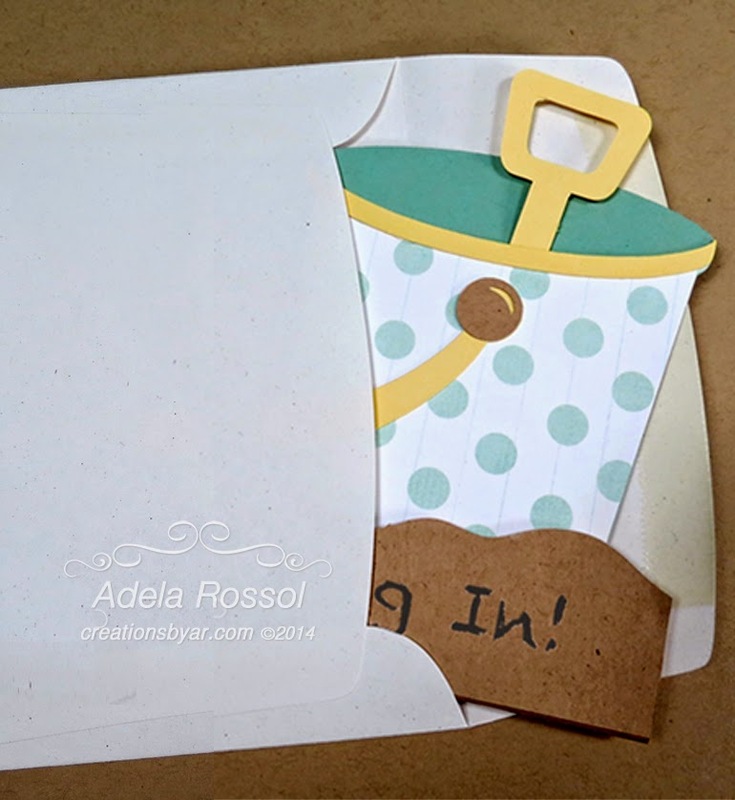 Add a sentiment or photo to the removable shovel and you have a really cute invitation! Be One of the 2 Winners! Visit the blogs of each of the AR Girls listed below and leave a comment to qualify for the random drawing. Another winner will be chosen randomly from the comments left on our AR Facebook Page so make sure to visit FB! Adela <-- you are here! Thank you for stopping by and enjoy the hop! Welcome to AR's Designer's Choice Blog Hop! Today the AR Girls and I are sharing our favorite templates and if you join us, you might be the lucky winner of an AR template of your choice! 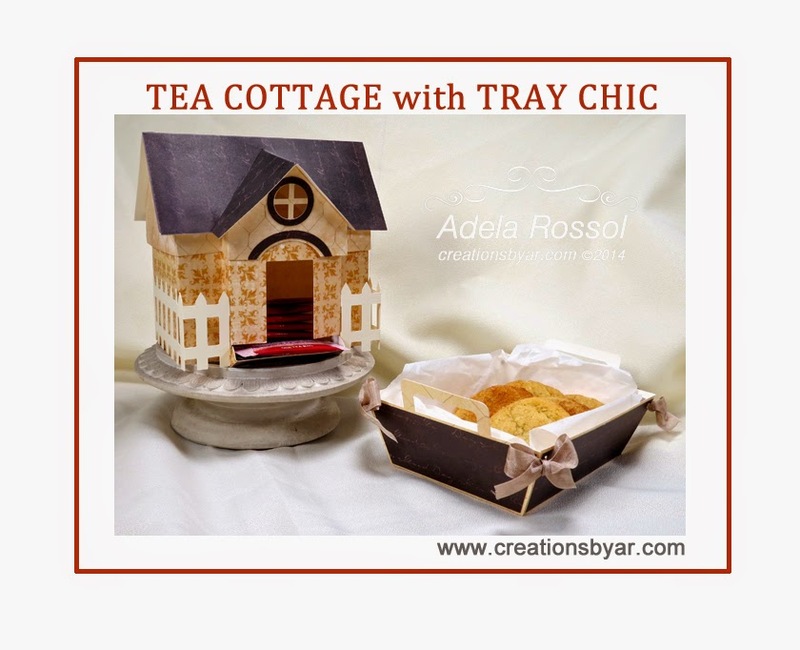 One of my favorites is the TEA COTTAGE and what better way to have tea than with a tray of cookies served on the TRAY CHIC? It's been a long time since I've made these two and I had forgotten how fun and useful these two are! • Visit each of the AR Girls' blogs listed below and leave each a comment. •Then, visit the AR Facebook Page and leave a comment telling us which template is your favorite or which template you would like to win. That's it! Comments will be accepted until Friday, May 16, 12:00 noon (Eastern). One winner will be chosen from thee AR Facebook Page and will be announced there on May 17. Ready to hop? Click away! APRIL AR RELEASE and HOP!